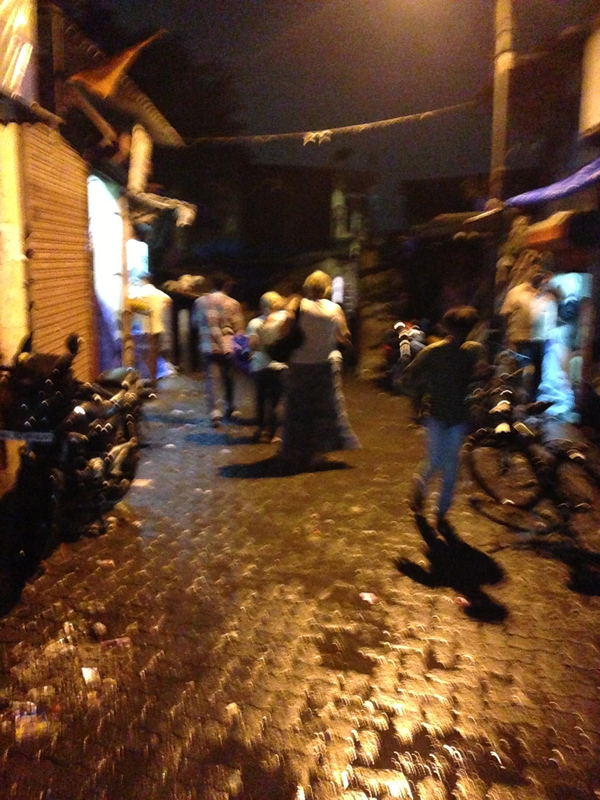 Tonight was one of the most interesting experiences of my trip to India and maybe my life. 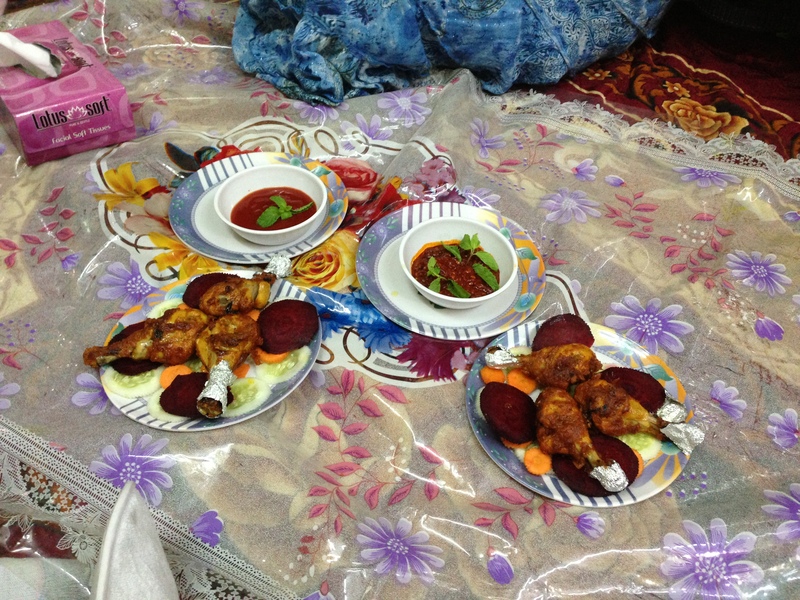 We visited Ahmed at his house for dinner. 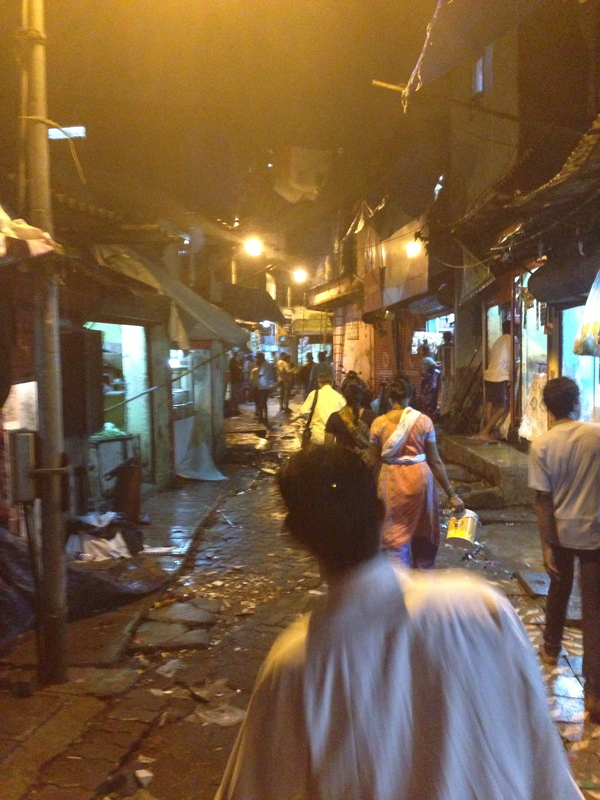 Think about what preconceived ideas you have about India, especially the poverty. That image you probably have in your mind of people crowded together in small spaces, dingy looking, dogs, cats, rats, trash, noisy — yep, that is what it is like, and that is what it was like to visit Ahmed in his village. We had to walk through twisty-turny, narrow walkways to get to his home after parking. As we walked, we saw numerous stray dogs and cats. As we were leaving, Ahmed pointed pout rats to us. Near the parking area there was a large pile of garbage. Ahmed explained that the city does come pick up their garbage, but during monsoon, it is not picked up regularly. Once we got into the walkways, there was not trash to be seen. In fact, in the little walkways there was very little garbage; you would see more on the streets of Chicago than you would in the little walkways. As we walked through, people stopped to look at us. On the way home, Ahmed said that he and his family were like celebrities now because foreigners never come to his village to visit. Ahmed’s house is three rooms, but I was only in the largest of the three, which is the main living area. I would estimate the room was approximately 10 x 12, and it was spread with a nice soft blanket for us to sit on. No air conditioning, but he had a new fan running that kept the air moving and the room was humid but comfortable. There was no furniture for sitting. Eventually, Ahmed did go get a chair, presumably from a neighbor, for Lillian. A great deal of respect is offered to Lillian since she is elderly. Dinner was spread out on the floor for us. There were chicken legs (Ahmed’s three year old son Ali calls them chicken lollipops), chicken and gravy, and chicken biryani along with rice, dal, and chapati. It was all really very delicious! I am pretty sure his wife Noor Janh (not sure of spelling — pronounced “Noorja”) bought new dishes and glasses for the dinner; the glasses still had stickers on them. His family was there — some sisters, a brother, and his mother — but none of them ate while we ate. It seemed paramount to them that we eat our fill before they considered touching any food. While we were visiting, a stray cat walked in and just sat by the door. When Ahmed started to put food out, the cat crept closer and started to mew. I am certain that cat wanted some food, but Ahmed shooed her out. While we were there, Ahmed showed us pictures of his daughter Masooma (sp?) from when she was a baby. He also showed us pictures from his wedding as well as the video. I can tell you two things for certain: one, the flowers were exquisite and extravagant; and two, Noor Jahn had on some of the most beautiful clothing I have ever seen. American brides talk about wanting bling; trust me, they don’t have bling compared to what Noor Janh had! She was a vision in flowers and sparkle. I would be lying if I said that the experience wasn’t a bit on the surreal side. 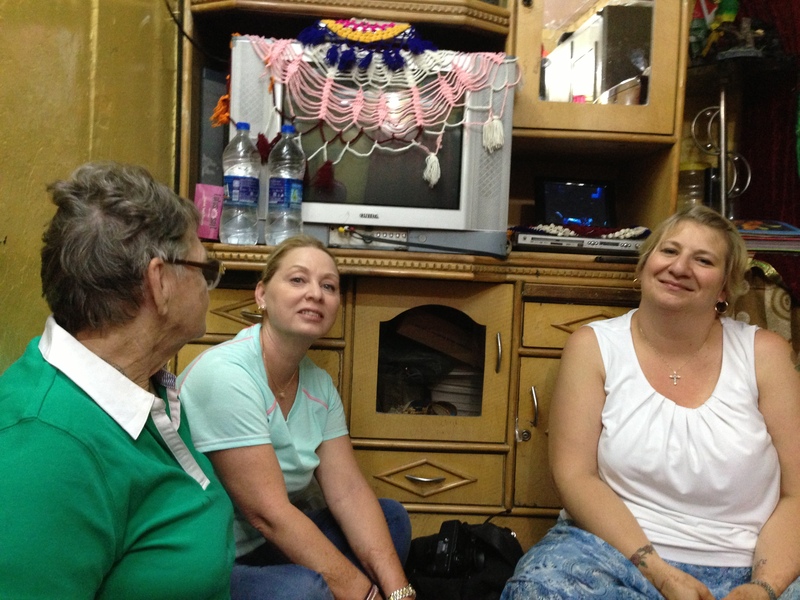 While his home was in what we in the U.S. would call a slum, it was clean and comfortable, and he had electricity, running water, a TV with a DVD player, a refrigerator, and a recently purchased washer and dryer. In some ways, he lives better than the poor in our country, yet in some ways he is worse off than the poor in our country. While I was not uncomfortable in his home (except for being old and fat and not the most graceful getting down on the floor or getting up from it, either), I was struck by how differently he lived from me. I will return from this trip not taking one single thing in my life for granted. Not my home or car or possessions or family or friends or pets. 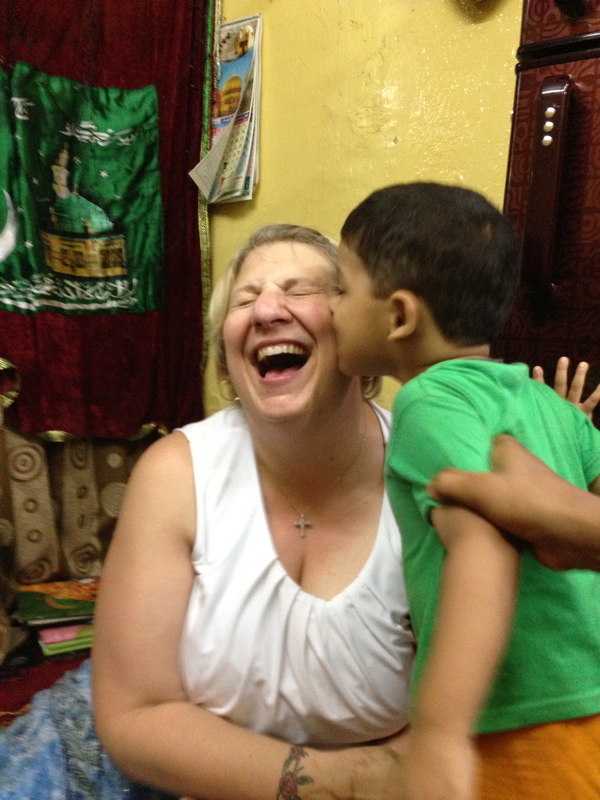 Ahmed was apologetic, saying he has a small home, but I can tell you that his home might have been small, and it might have been sparse, but it was filled with a family who went out of the way to make us feel honored and welcomed there. Tonight was proof positive that someone absolutely does not have a home based on the material things in the house or the size of the house or the appearance of the house. It has everything to do with the people who fill it, who are proud of where they live and want their guests to be welcome in the house. Sitting on the floor at Ahmed’s house. Getting a kiss (actually a little nibble) from Ali.